We have been doing a lot of baking at our house this week: Cupcakes for Caleb's 1st grade class for his birthday, a cake for the cake walk at the school's carnival, and cookies for the bake sale there. The Owl Cupcakes, above, were so easy and fun to make. The eyes are opened Oreos and Junior Mints. The ears are made from the other half of the Oreos. The beaks are banana Runts (who doesn't love the banana ones?). We found these fun cupcakes in the wonderful book, Hello Cupcake! Whooo Whoooo Whoooo loves these cupcakes? I do! This morning my twins, who are 10 (both of them, imagine that! ), did some baking for their school. Derek made the cake mostly himself. After frosting the cake, he swirled melted white chocolate around, then with a toothpick, ran through the white chocolate, from the middle out, to make the web. The spider was created with some leftover Oreos, a Junior Mint, and some black licorice. Fun, and easy enough for a kid to do. These Candy Corn Cookies are also very easy (and super tasty!). Dylan started with pre-made cookie dough. We were lucky enough to find dough that was already orange and punched out into pumpkin shapes. Dylan rolled the dough out again, and cut them with a christmas tree shaped cutter (removing the trunk), but you could just cut the orange dough into triangles if you don't have the right cutter. After they were baked and cooled, he dipped the tips into melted white chocolate, and the bottoms into melted semi-sweet chocolate. They are so cute, and SO delicious! Halloween is almost here, but these treats are so easy, you still have plenty of time to bake something fun! We have a family tradition of having a Freaky Food night every October. We started out doing it on Halloween, but it was way too crazy to really enjoy the evening when we were busy trying to put on costumes and attend all the Halloween activities, let alone go trick-or-treating on Halloween. So now we have it sometime in the week of Halloween, and it is a lot more fun. Remember, I have 6 sons, so it takes a lot to turn their stomachs. But I sure try! A bloody favorite of our family - severed fingers. Simply wrap one end of a Little Smokies sausage in bandages made from strips of tortilla and secure with a tooth pick. Bake, then remove toothpicks, and dip "severed" end into catsup, and add a bit to the tip of the finger with your finger to make the nail. They look really disgusting but taste really good. For the Body Part Appetizers, we simply stuck gummy body part candy to Ritz crackers with a bit of red jam. Goblin Grins are made from asian peas, pepperoni slices, and slivered almonds. My friend Shari made these witch fingers out of string cheese and bell peppers. I LOVE them! She also made these Monster Mouths with apples and slivered almonds. The almonds and crisp apples are a tasty combination! Take another BITE! Mummy dogs are hot dogs wrapped in strips of refrigerated crescent rolls, then baked. Eyes are mustard. These disappear fast! Meatloaf just like your mummy used to make. Make meatloaf, only instead of putting it in a loaf pan, mound it in a dome on a baking dish. Bake, than add a catsup/mustard/brown sugar mix on top. The eyes are fresh mozzarella balls and olives, and the entire head is covered with cooked lasagna noodles. If you can find the kind without the curly edges, use them. We had to cut the wavy edges off ours. Everybody, parents and kids alike, loves this one! And a hold-out from our very first freaky food night years ago - Blood and Guts. Tomato soup with pulled string cheese added just before serving. My kids ask for Blood and Guts all year round. I threw my twins an Indiana Jones birthday party last year, and just had to come up with Chilled Monkey Brains. I took canned pear halves, and with a skewer carved them into brains. take off the top narrow part of the pear, then carve the line down the middle kind of deep to make two hemispheres. Then make the wrinkles by just swirling around the skewer into each hemisphere-are. Put them back in their own juice that has red food color added to it, and let them chill for a few hours. They are really very easy, once you try a few and get the hang of it. Super creepy too. The kids did these ghost cookies. They just took a package of frosted oatmeal cookies, and using their fingerprints dipped in yellow food coloring and chocolate chips make the eyeballs. My friend Roxanne brought this more-cute-than-creepy Jack-O-Lantern cheesecake. It was exceptionally delicious! And for dessert, my sister Lisa made this too-realistic-to-stomach Kitty Litter Cake. It is really, really, really disgusting. She made it in a real (unused, of course) litter pan and served it with a kitty litter scoop (also new). Find the recipe here. The little kitty turds are really microwaved Tootsie Rolls! Don't you just want to sink your teeth into one of those? Yah, I didn't think so. What a freaky feast we had! Are there any freaky foods that you like to serve your family? Please do your best to turn our stomachs! Alysa says: Hi Everyone! Yes, I've fallen off the face of the earth. I think October has been the busiest month. Has it been for you? Lots of good things to be involved with and attend. One afternoon, my two little ones and I painted these candy corn pots. Very easy. We actually taught this craft at two different parties (8-11 year old girls) the past two weeks. Thank you Martha Stewart. Use pencil to mark stripes on pots (if you need to or just do the width of the paint brush). Brush on acrylic paints between lines to make bands, letting each color dry before moving on to the next. When painting the top stripe, go over the lip of the pots and paint inside (so they will look good even as they're emptied). Once the pots are dry, place a cellophane bag in the pot and then fill with handfuls of candy corns. The finished pots came in handy as "thank yous" to the many events we attended this month or as new people moved into our area. So next time you're running errands, grab some supplies and enjoy making these by yourself or with your children. I have been having more fun stamping some creepy Halloween cards and goodie boxes these last few weeks. We made this one for our stampin' club. The matchbox was easily cut out using the Big Shot, and the great crows and tombstone come from the Graveyard Gala stamp set. I love that set! The birds were embossed in black, and the moon was punched from yellow paper. The skull and wings have been cut out are are sticking out 3D from the tombstone. Four chocolate nuggets fit perfectly inside. I wrapped each with strips of SU fabulous decorative paper. I love, love, love this project! I also love the spooky elegant look, and this card is IT! I used the elegant Medallion stamp, one of my favorites, and wanted to make it look kind of like a spiderweb, so I embossed it with glittery hologram highlights glitter (hard to see in the picture.) Then I embossed the perfectly creepy spider from the From The Crypt stamp set in black on grey, and layered it with a snippet of some of the creepy netting I have hanging all over my house this time of year. I think it looks terrific! We made little goodie bags using just brown lunch sacks that we cut down, and covered the front a back with card stock. The handle is punched from with the large oval punch. The front is stamped and the back is covered with decorative paper. Such an easy project! Even easier was this too cute mummy card. The eyes were just punched out, and a quarter sheet size of white paper was torn into strips and the tron edges sponged, then glued back on to the card in random order to make the wrappings on our mummy. Another longer strip of torn paper was tied in a knot and stuck on with dimensionals. Anybody could make this great card! This card is a bit more complicated. The skull stamp is also from the From The Crypt stamp set. I embossed it in black, then daubed on some orange, purple, and green ink around the skull. I used some pearly shimmer paint on the skull to make it glow (again, you can't tell from the picture, but it looks great in person.) You also can't really tell from the picture, but I used the Big Shot to emboss a harlequin diamond pattern on the green background paper. Funky card. Inside it is so fun to find finger, and bony finger lollipops that I discovered at Target. I had to cut the sticks short to fit them inside the coffins, and tied them with SU's absolutely delightful new striped grosgrain ribbon! I think it would be a great invitation to a Halloween party. You could add a tag to the bow that says "remember the date". Get it? To DIE for! 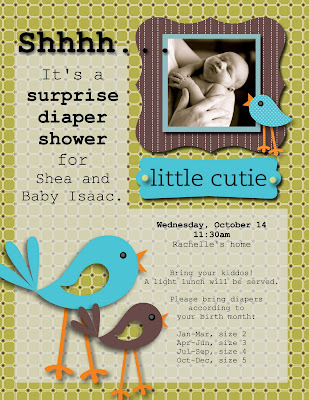 On Wednesday I threw a surprise baby shower for my friend Shea and her sweet new baby. The theme was birdies, and it was so fun to do. Since it is finally fall here in the desert I decided to chance it and have the shower outside. It was a bit warm, but we managed. For a table cover I used a fun quilt top I found at a garage sale a few weeks ago. It is from the 30s of 40s and the fabric is so very fun and retro! It is an unfinished quilt top, but works perfectly as a tablecloth for my big square table. Also a pitcher of flowers and some little fat green birdies. I also did the Baby Isaac framed picture on My Digital Studio. It took me just minutes now that I had the program figured out. Cute! The fun thing is, that the images and colors on the software match the stamps, inks, and decorative papers that SU sells, so I was able to make everything to match the invitations exactly. The BABY pennant banner (see beginning of post) I made for decoration was made with the cutest decorative papers with the same birdies and same colors! Yummy fruit pizzas (thanks Ann!) and icy lime water worked to cool us all off a bit. You can't see it from here, but I stamped little birds on branches on the cups and napkins. The invitations worked. We had 20 ladies and the Uncrustables and pre-sliced apples were a hit with the kiddos. My dear friend Shari made her incredible famous homemade chocolates for the occasion! Scrumptious! Using the same stamps and papers I made little picks to go on top of the cupcakes. Instead of putting the bright sprinkles on top, I rolled the edges in them instead. As part of her gift, I stamped Shea a bunch of thank you cards. I meant to have the ladies put their own addresses on the envelopes while they were here, but I forgot. Oops. The mommies got a little something special too! I made these little matchboxs with my favorite toy, my SU! Big Shot. They slide open to reveal four little chocolate nuggets wrapped in the decorative paper. How cute is that?!? I even stamped another little birdie on the inside. I just love details! What a fun party it was in the middle of the day in the middle of the week! My friend Shea really was surprised, and everyone had a great time. Thanks to everyone who helped make it all work! In dark corner of the witch's lair is a pile of old spell books and the bloody candelabra that the old hag reads them by. I started with a old broken candelabra lamp that I found in a garage sale. First I removed the light fixtures and the wiring, then I carefully removed the crystals, spray painted the whole thing black, then hung the crystals back on. I have seen bloody candles for sale in stores, but they are very expensive. I had some used and broken white and off-white taper candles. I just used a lighter to drip red wax from another old candle I had all around the edge of the tapers. A five minute project! The witch still has the bouquet given to her by a lover, long dead and gone. I used a great shaped silver vase that I found at a garage sale, and filled it with black flowers. I found the cheapest, ugliest flower picks I could find at the dollar store (the ones with the nasty netting are the best!) and spray painted them black. The bloody candelabra sits on a stack of old books I have collected at garage sales over the years. It doesn't matter what the subject matter is - if they are old with interesting covers and bindings, I'll take them. 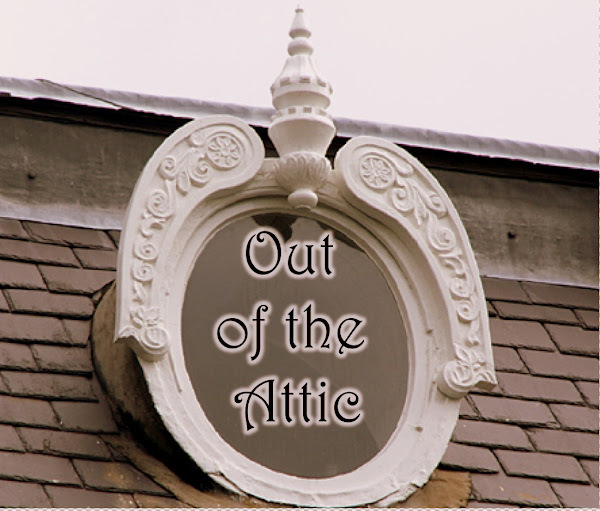 First, I must say that I'm SO SO SO SORRY that I have let my fellow attic diggers down. Here you all were, enjoying yourselves, digging around in my attic, at my invitation, and I basically turned out the light, and left you all in a dark attic wondering if I just went downstairs for a quick snack or if I have left you there for good. What kind of hostess am I anyway? I feel like such a witch. My apologies. I have just gotten a little distracted (Paris will do that to a girl) is all, and life got crazy. But I have finally gotten into the swing of things a bit (have the kids already been in school a month already?) And with the holidays coming, I am feeling my creative juices flowing again. I got all my Halloween decor up yesterday (Oct. 1st - I don't mess around! ), and everything looks great. I will post all of them in a bit - after I add a few little touches. I get way out of control with my Halloween decor. But here is just a little peek into the "witch's lair" and an easy idea you might want to try. In the entryway of the witch's lair, I have, of course, a place where she can hang her pointed hat and broom after a long night spooking trick-or-treaters. I thought the witch would want to have some family pictures of her wicked predecessors in the entryway. I don't have before pictures because I made these last year before starting this blog, but I basically had 3 unfinished round frames, with no glass or backing, that I found at a garage sale. They don't even match. I just spray-painted them black, and cut out some heavy white cardstock to fit in the frames. Then I drew some witch silhouettes on black paper, cut them out and glued them to the white cardstock (with the pencil marks down). Then I glues them into the backs of the frames. Done. They are witches, so the are supposed to be, well, ugly, so they are not too hard to create of your own. Just make a crooked pointy hat, a long nose and a long chin, some hair - you know. You can look at mine if you want, and just practice drawing some until you get a few you like, then transfer it onto a black paper and cut it out. If you are not brave enough to make your own, then maybe you could look up images online of witch profiles or something, and use them as a pattern. Then hang some old keys, striped long socks, some black lace, a cape and hat with a mother-of-pearl antique buckle, and of course, the broom (I found that crooked sweeper at Cost Plus last year.) Oh, and a furry rat was a nice creepy touch, huh? Anyways, happy haunting you all... from my witch's lair to yours!